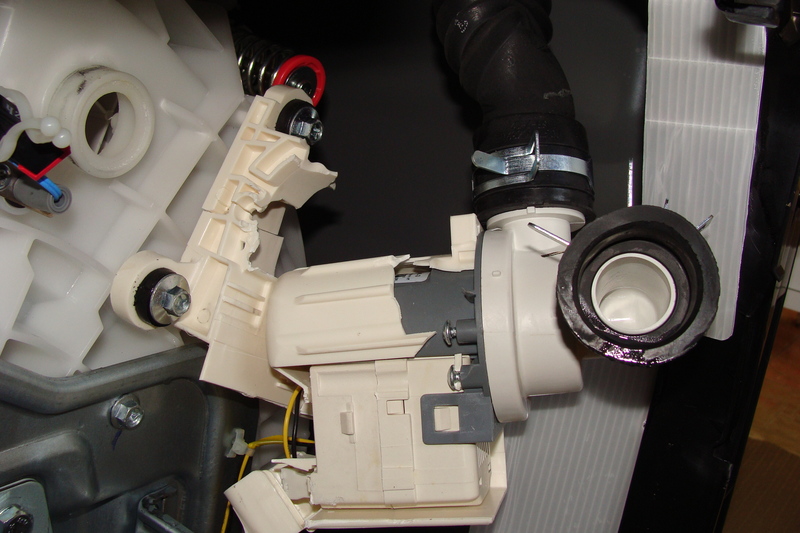 Recently, we updated our blog to include another instance of a failed drain pump bracket in a Samsung washing machine. In that update, it was reported that the Consumer Product Safety Commission’s (CPSC) local representative had been notified and asked to investigate. On August 26, we were notified that the CPSC’s compliance division was not taking any action at this time. It is therefore recommended that consumers who have experienced problems with Samsung’s drain pump bracket failures report the failures to the CPSC. The website address is http://www.cpsc.gov . Follow the links to on the home page to submit your complaint. An exemplar photograph of a broken bracket and pump is shown below. Earlier this past July, it was reported that Samsung was experiencing a problem with drain pump bracket failures in some of their washing machines. Another Samsung washing machine has been encountered with the same problem. This time, the bracket problem is in model number WA456DRHDWR/AA. As in the previous description, the bracket fails, the pump hangs and eventually pulls the inlet drain hose off of the wash tub allowing water to flow freely onto the floor. Since there are a number of complaints about this problem on-line, a representative of the Consumer Product Safety Commission has been contacted and asked to investigate to determine if a recall should be initiated. To date, no word has been received from the CPSC on what will happen. We have discovered that there are a number of complaints regarding Samsung washing machines on the internet. While investigating the cause of water damage to a residence, it was determined that a drain pump bracket had broken in one of Samsung’s laundry products. The incident details have been reported on our website. Please visit us at www.rjhill.com/ click on Samsung Washing Machines in the toolbar. Based on the number of complaints found on line, this is not an isolated incident and Samsung should be well aware of the bracket failure problem.